Whether you’re planning to put your home on the market in the new year or simply want to give your property a facelift, redesigning your garage presents you with a huge array of options. At Wessex Garage Doors, we understand that deciding on the right colour, style and material for your home can be a challenge and are more than happy to help you get it right. The construction of your door is usually the biggest dilemma, particularly as it has an impact on the styles and colours that are then available. Here’s our quick list of pros and cons for the most popular types of garage door on the market. Steel garage doors offer both strength and style at an affordable price. The versatility of steel doors means that there are styles, sizes and colours to suit all kinds of property, whether you own a contemporary townhouse in the city centre or a Victorian semi in the suburbs. A drawback of steel is that it’s not a good insulator – however we offer a few ways in which this can be addressed at a cost-effective price if you’re worried about your home getting cold. Steel is also vulnerable to dents and will corrode if not properly taken care of. Aluminium is often chosen as a lightweight alternative to steel. It isn’t quite as durable as steel (and will be easier to dent with rogue footballs and even in bad weather), but is more naturally resistant to corrosion. It’s a low-cost option that is a good choice for homes exposed to salty sea-air or if you need a quick garage door replacement that doesn’t need to last a very long time. 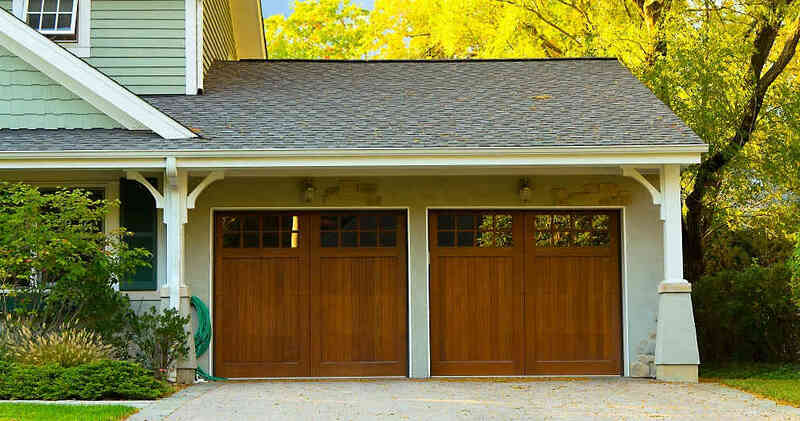 Wood garage doors are known for their luxurious finish that makes any property look elegant and welcoming. The wide range of styles means that you can always find a design that suits the architecture and aesthetic of your home, boosting its curb-appeal and value at once. Not only do wooden doors look great, but they’re very strong and have relatively good insulative properties. This is particularly important for garages that are attached to (and have access into) the main house, keeping your property secure and heating bills low. 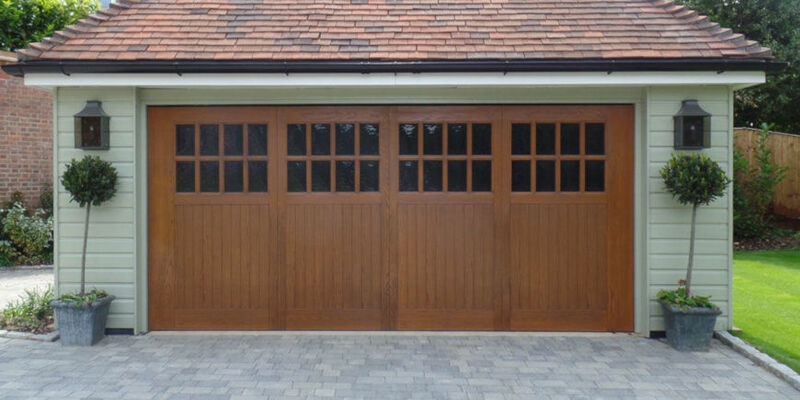 The main drawback of wooden garage doors is that they do require some maintenance. The natural expansion and contraction of the material means that bolts may need to be routinely checked and tightened and there is a risk of the wood splitting or rotting if not properly treated. Regular painting and sealing are recommended. 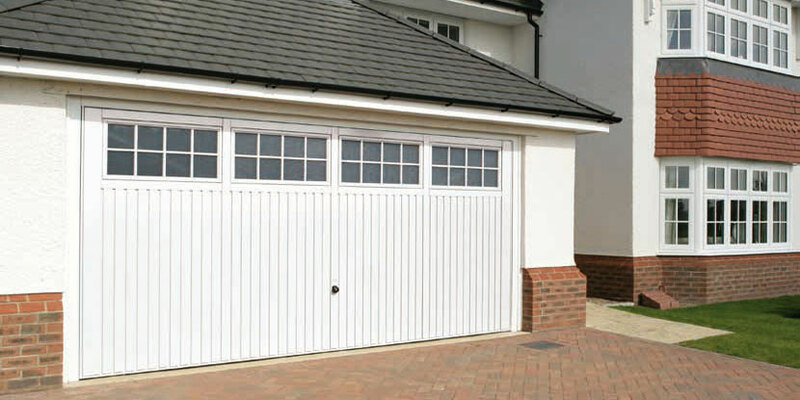 Garage doors made from glass-reinforced polyester (also known as fibreglass garage doors) are known for being lightweight and easy to maintain. They’re highly resistant to rust, withstand minor bumps and scrapes, and you won’t need to worry about them splitting. GRP comes in a vast range of colours, and some homeowners choose to paint their doors to change the look after a few years. However, major impacts will still compromise the security of the door and GRP is not recommended for extremely low temperatures, which can cause the material to become brittle. 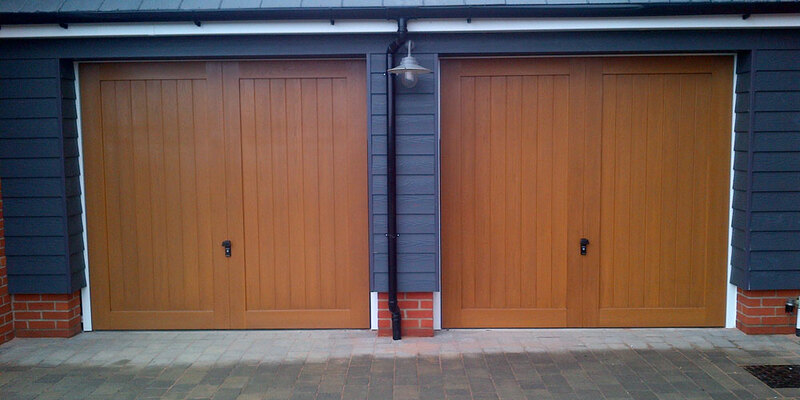 The main benefits of vinyl garage doors are that they are very low-maintenance and highly customisable, available in all kinds of colours, including wood-effect. They do not require any special sealing or repainting – just an occasional wash with warm water or a power-washer – and they are generally difficult to dent or scuff. You cannot paint or stain vinyl, so you will need to choose the colour carefully if you like to update the front of your home often. Vinyl also doesn’t offer great insulation, so a specific insulative model will need to be chosen if you want to keep your garage a constant temperature. For more information about the door types we have available and to get a specific recommendation for your property, give us a call. We’re always happy to answer your questions and can provide any additional information you need about the doors in our range.